Infinite Possibilities Day 10: Create an affirmation for each theme. This one has forever changed my life, just so you know it. And the important detail - to sit down for 15 feet up - is what makes it magic. Sitting down relaxing - with good concience, gives more energy than any amount of time procrastinating... 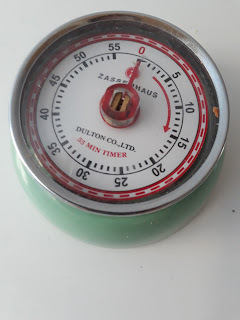 I remember how quickly after I started flylady that I decided to invest in a pretty timer. I was poor as can be, but I started giving myself pennies (the equivalent in my currency of course) for the tasks I did in FlyLady. I knew which one I wanted, and decided at the end of each week if I had completed the BabySteps and the 15 minutes I got $5 - one for each day. It was quite a lot for me, in my budget - but the effect of the 15 minutes was so miraculous that I even changed my name, and $1 a day I decided I had to find for myself.